Valentin Alexandrovich Serov, Girl with Peaches (1887), oil on canvas, 91 x 85 cm, Tretyakov Gallery, Moscow. WikiArt. There are several Russian (and Ukrainian) painters who have been claimed to have had impressionist styles, usually for a period in the late nineteenth century. 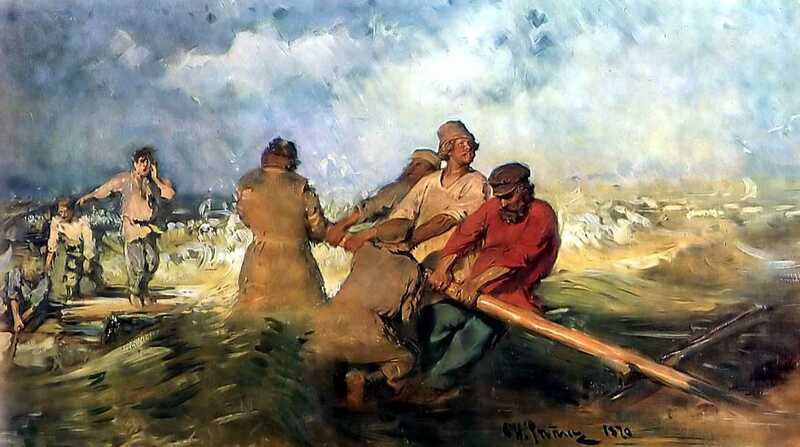 However limited documentation and availability of suitable images makes it difficult to cover more than two: the great painters Repin and Serov. He was born in the city of Chuguyev (now Chuhuiv), in the Ukrainian province of Kharkiv, in 1844. After two years at a military school, in 1856 he became a pupil of a local icon painter, and from 1859 was painting icons and wall paintings. In 1864 he was allowed to attend the Academy of Arts, although was not admitted there as a student. However his work flourished there, and in 1869 he was awarded a gold medal. In 1870 he travelled to the River Volga to make studies of barge haulers, or burlaki, and started work on his large realist painting depicting them at work. Some of those studies show loose brushwork and developing high chroma colours. Ilya Yefimovich Repin, Burlak (Barge Hauler) (c 1870), oil on canvas, dimensions not known, location not known. WikiArt. Ilya Yefimovich Repin, Barge Haulers on the Volga (1870-3), oil on canvas, 131.5 x 281 cm, State Russian Museum, Saint Petersburg. WikiArt. In 1871 he was awarded another gold medal. The following year he met Pavel Tretyakov, the art collector who founded the eponymous gallery. In 1873 he travelled with his family to Italy and then to Paris, where he started to paint in a more impressionist style, presumably influenced by the works of the French Impressionists. 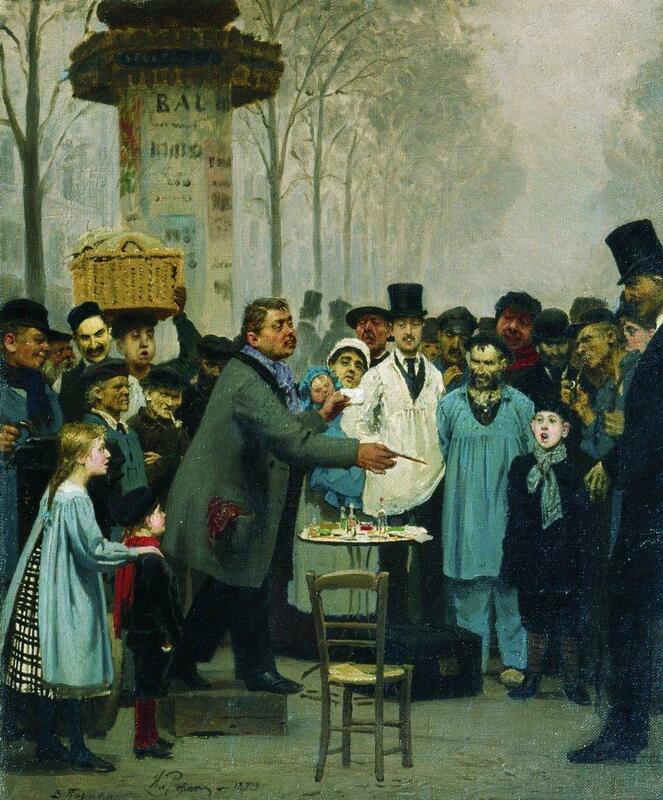 Ilya Yefimovich Repin, A Newspaper Seller in Paris (1873), oil on canvas, dimensions not known, Tretyakov Gallery, Moscow. WikiArt. 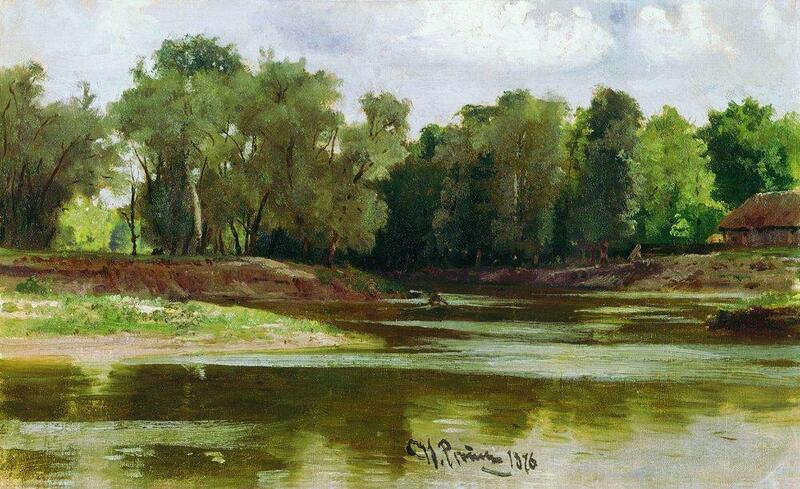 Ilya Yefimovich Repin, Riverbank (1873), oil on canvas, dimensions not known, The K. Savitsky Picture Gallery, Penza, Russia. WikiArt. 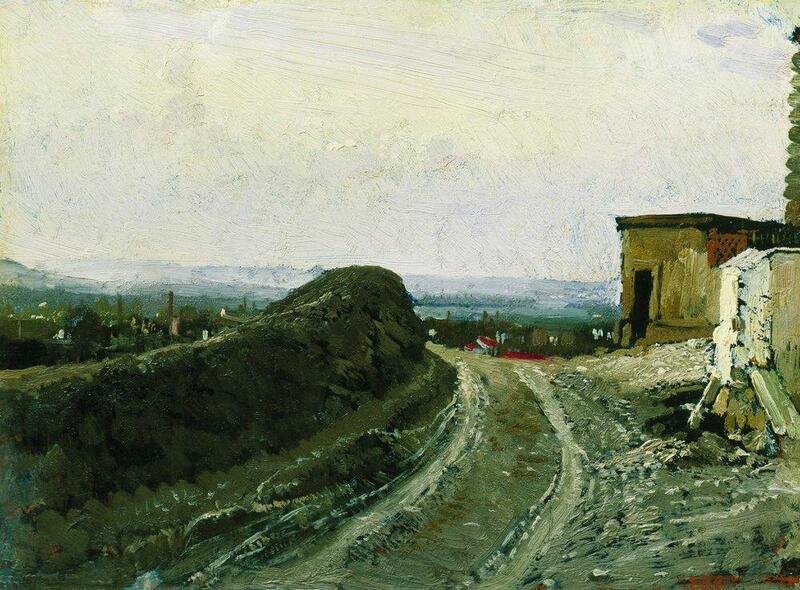 Ilya Yefimovich Repin, The Road from Montmartre in Paris (1875-6), oil on canvas, 24.5 x 32.5 cm, Tretyakov Gallery, Moscow. WikiArt. He was successful in submitting to the Paris Salon, and had paintings shown in the exhibitions of the Itinerants’ Society back in Saint Petersburg. In 1876 he returned to Saint Petersburg, and was made an Academician on the strength of his realist painting Sadko in the Underwater Kingdom. Although he admired and used impressionist techniques to depict light and colour, he was critical of the lack of moral or social purpose among the French Impressionists, considering that his work should have such purposes. In 1877 he moved to Moscow, where he established a successful portrait studio. 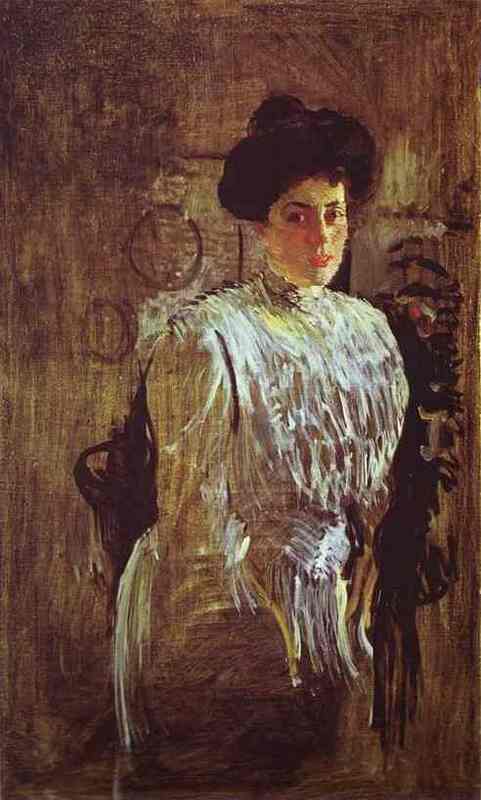 The following year he made friends with Leo Tolstoy, whom he painted on several occasions, and socialised with Valentin Serov and other artists. His prosperity enabled him to buy a country estate at Abramtsevo, where he entertained other artists. He also travelled, visiting the Ukraine in 1880 and the Caucasus the following year. Ilya Yefimovich Repin, Girl with Flowers. Daughter of the Artist (1878), oil on canvas, 61 x 49 cm, Museum of the Academy of Arts, Saint Petersburg. WikiArt. 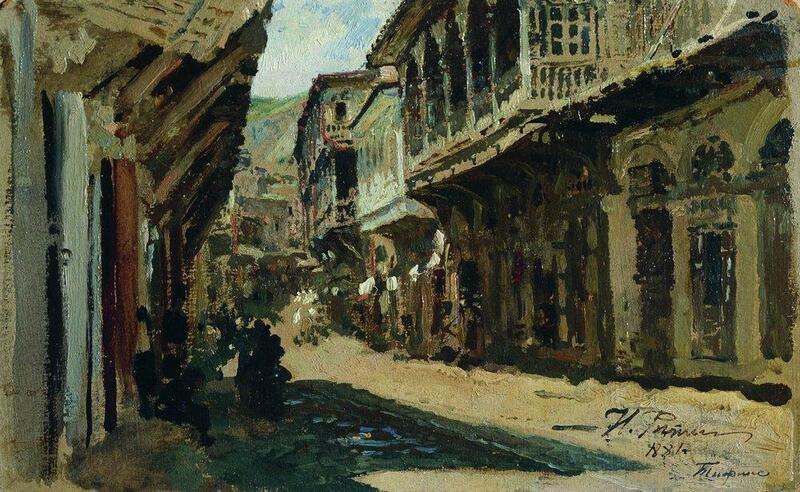 Ilya Yefimovich Repin, Street in Tiflis (Tblisi, Georgia) (1881), oil on canvas, 14.5 x 23.5 cm, The Pskov State United Historical, Architectural and Fine Arts Museum, Russia. WikiArt. In 1883 he toured Europe, in 1886 the Crimea, and in 1887 Austria, Italy, and Germany. 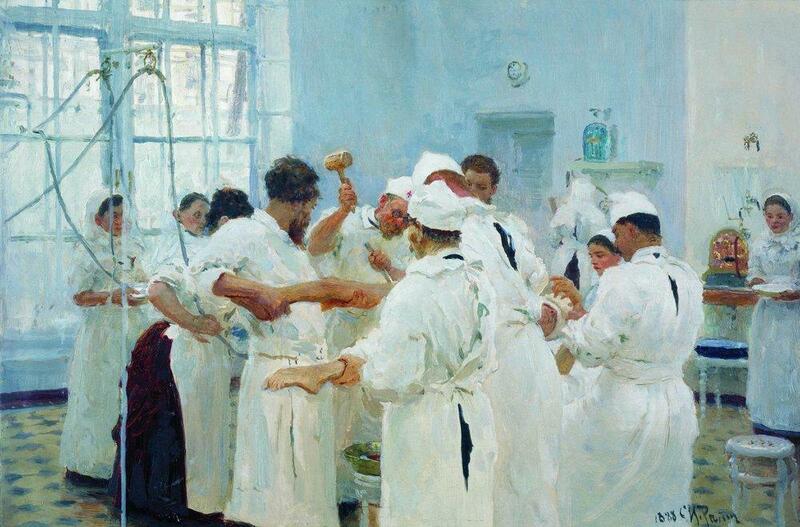 Ilya Yefimovich Repin, The Surgeon E Pavlov in the Operating Theatre (1888), oil on canvas, 27.8 x 40.3 cm, Tretyakov Gallery, Moscow. WikiArt. Ilya Yefimovich Repin, Storm on the Volga (1871-91), oil on canvas, 55 x 102 cm, State Russian Museum, Saint Petersburg. WikiArt. He visited the 1889 Paris World Exposition, returning via London, Zurich, and Munich; the following year he made another trip to the Volga, then on to the Crimea and Odessa. A major exhibition of his works, and those of Shishkin, was held at the Academy of Arts in 1891, and in the next year he had a solo exhibition in Moscow. In 1893 he visited art academies in Warsaw, Kraków, Munich, Vienna, and Paris in preparation for teaching at the Higher Art School of the Academy of Arts, which he did from 1894-1907. 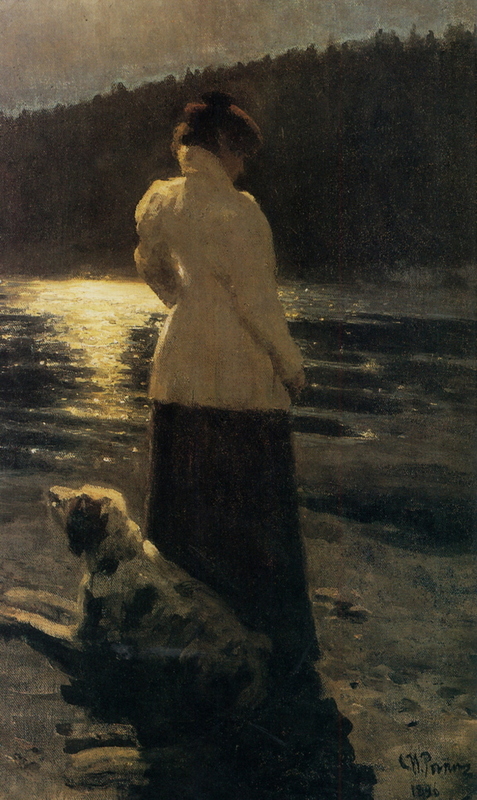 Ilya Yefimovich Repin, Moonlit Night at Zdravnevo (1896), oil on canvas, 143 x 90.4 cm, The National Art Museum of the Republic of Belarus, Minsk. WikiArt. In 1898 he visited Palestine, bought an estate known as The Penates at Repino near Saint Petersburg in 1899, and in 1900 served on the jury of the Paris World Exposition. This time he returned via Munich, the Tyrol, and Prague. He was awarded the Legion of Honour in 1901, after which he undertook studies for the major work depicting the Ceremonial Meeting of the State Council, completed in 1903. He became involved in the growing unrest in the first decade of the twentieth century, sketching the opening of fire by government troops in 1905, and publicly denouncing the death penalty in 1908. 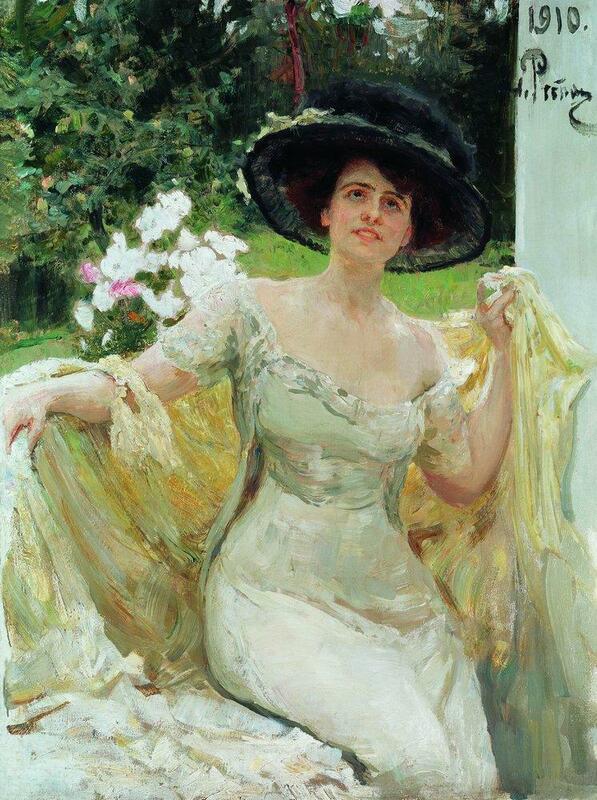 Ilya Yefimovich Repin, Portrait of Bella Gorskaya (1910), oil on canvas, 125 x 93 cm, location not known. WikiArt. 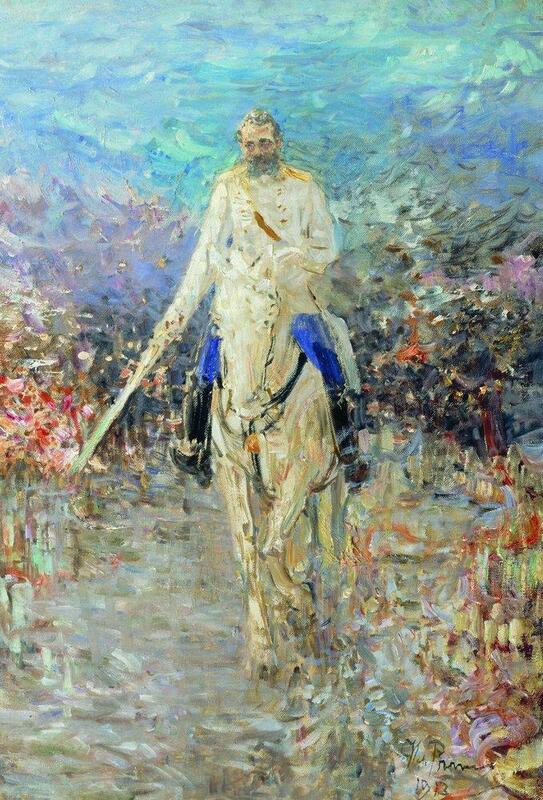 Ilya Yefimovich Repin, Equestrian Portrait of Alexander II (1913), oil on canvas, dimensions not known, location not known. WikiArt. He wrote various autobiographic works and reminiscences with the help of some of the best authors of the day, including Tolstoy. Although a supporter of the 1917 revolution, the following year his estate The Penates was on the Finnish side of the new border between Russia and Finland. He made personal peace by giving his collection of Russian art, and some of his own paintings, to the Finnish National Gallery in Helsinki. A major retrospective exhibition was held in Prague in 1923, and a jubilee exhibition in the Russian Museum in Leningrad in 1925. He died in 1930, and was buried at The Penates, in what was then Finland, but which became a part of the USSR in 1948. 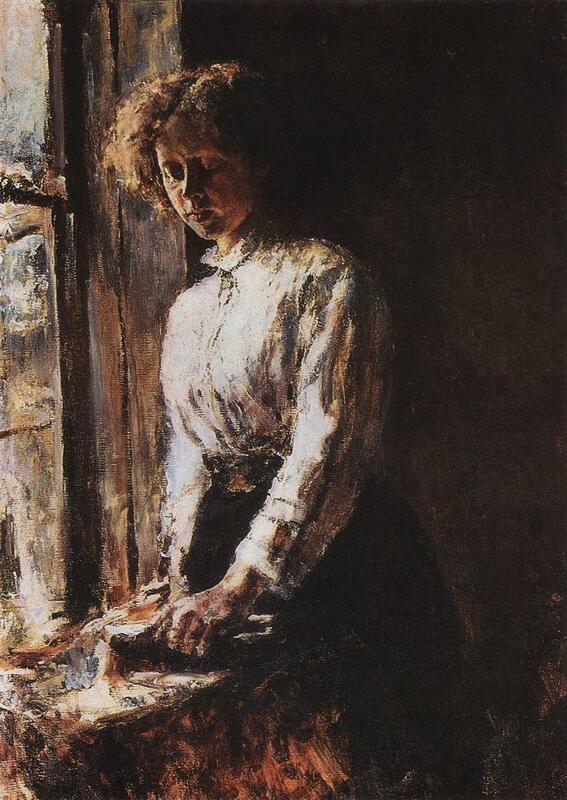 With his thriving portraiture work and many other commissions, Repin certainly showed some quite strong impressionist style in various of his more personal works, but remained at heart a realist, although perhaps not as strict as others such as Isaak Levitan. He was born in Saint Petersburg in 1865, the son of composers, and was able to study drawing and painting from childhood, in Paris, and both Moscow and Saint Petersburg Academy of Arts from 1880-5. When in Moscow he was taught by Ilya Repin, and he was inspired to paint in realist style at first. He also became involved with the Abramtsevo artist colony. Once he had left the Academy, during the late 1880s, he started to develop an overtly impressionist style, particularly in his oil sketches. Valentin Alexandrovich Serov, By the Window. 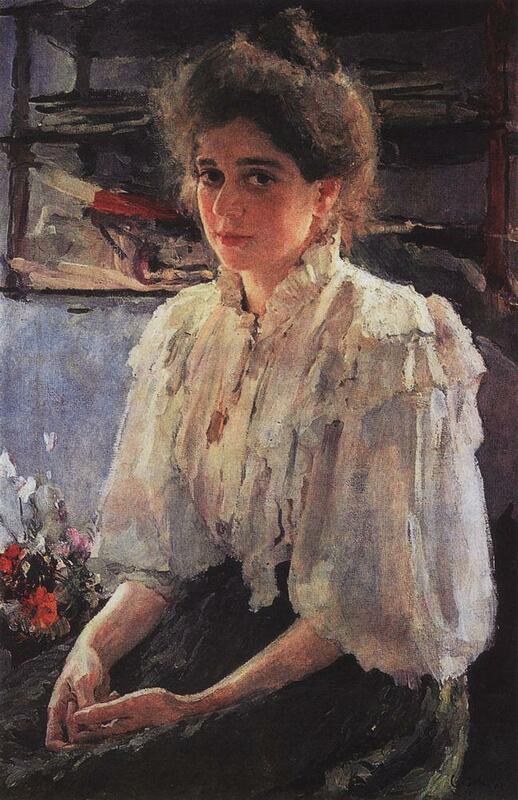 Portrait of Olga Trubnikova (1886), oil on canvas mounted on cardboard, 74.5 x 56.3 cm, Tretyakov Gallery, Moscow. WikiArt. 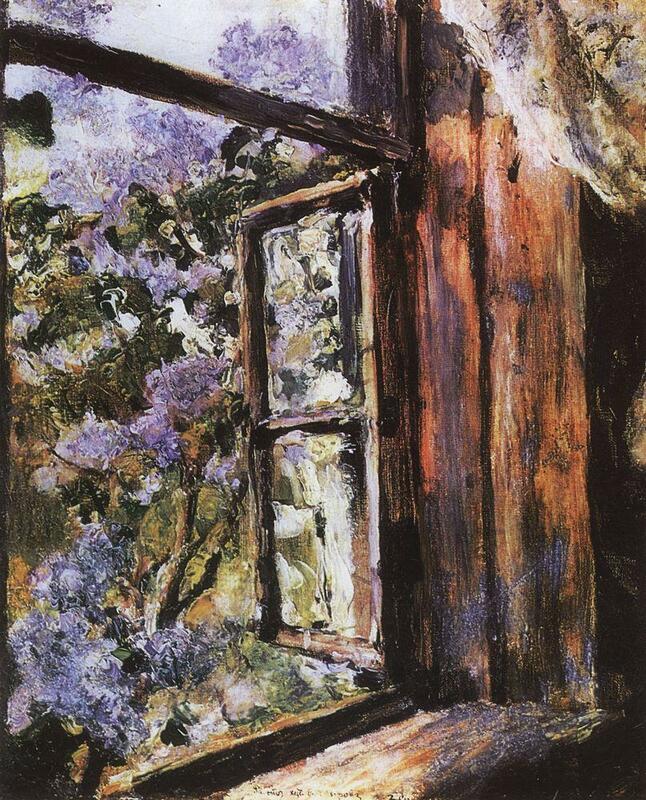 Valentin Alexandrovich Serov, Open Window. 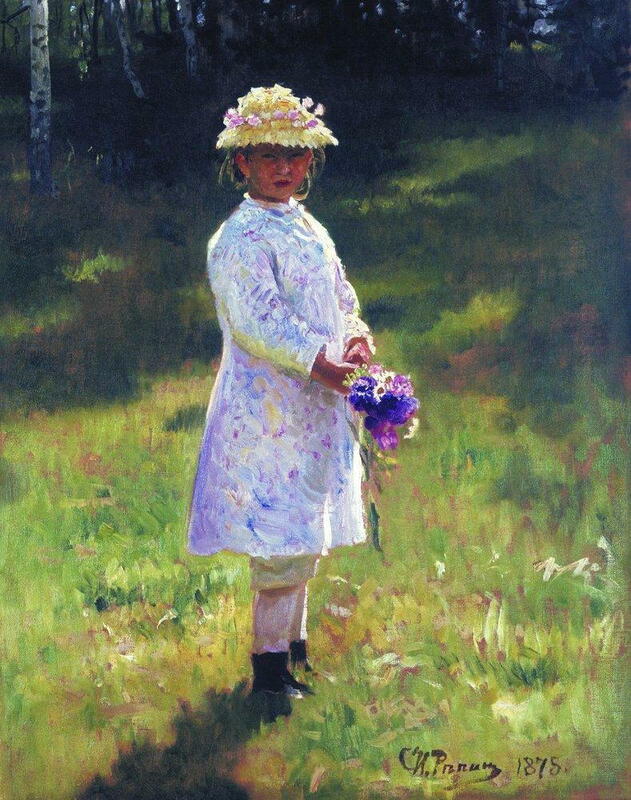 Lilacs (1886), oil on canvas, 49.4 x 39.7 cm, The Art Museum of Belarus, Minsk. WikiArt. He started to concentrate on portraiture, allowing looser brushstrokes to appear in clothing and fabrics. His Girl with Peaches (1887) is often regarded as the first work of Russian Impressionism. 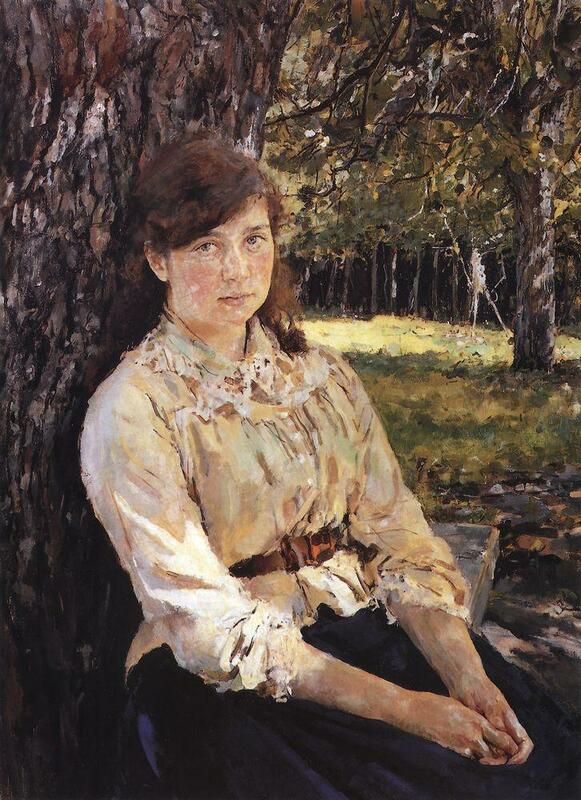 Valentin Alexandrovich Serov, Girl in the Sunlight (Portrait of M. Simonovich) (1888), oil on canvas, dimensions not known, Tretyakov Gallery, Moscow. WikiArt. From 1890, he painted almost exclusively portraits, which included fellow artists such as Isaac Levitan, and composers like Rimsky-Korsakov. Valentin Alexandrovich Serov, Portrait of Maria Lvova (1895), oil on canvas, 87 x 58 cm, Private collection. WikiArt. He broadened his range of media to include pastels and prints, and in the 1890s turned again to rustic landscapes, and scenes from Krylov’s fables. 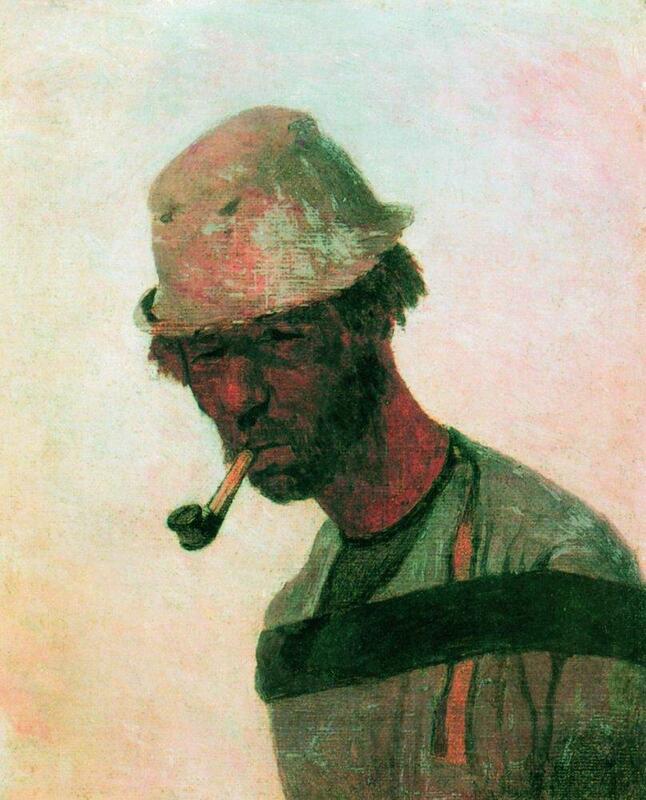 From 1900 he became more modernist, but continued to produce quite realist portraits. 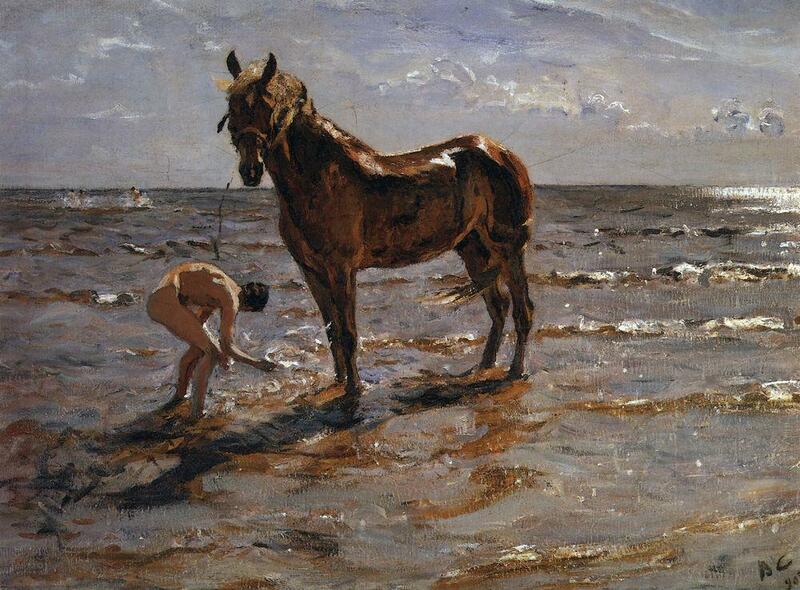 Valentin Alexandrovich Serov, Bathing of a Horse (1905), oil on canvas, 72 x 99 cm, State Russian Museum, Saint Petersburg. WikiArt. Valentin Alexandrovich Serov, Portrait of Margarita Morozova (1910), oil on canvas, 143 x 84 cm, Art Museum of Dnepropetrovsk, Ukraine. WikiArt. He too protested against the bloodshed and oppression which occurred in the early years of the twentieth century, resigning from the Saint Petersburg Academy of Arts, and painting historical and mythological works thereafter. He died in 1911. 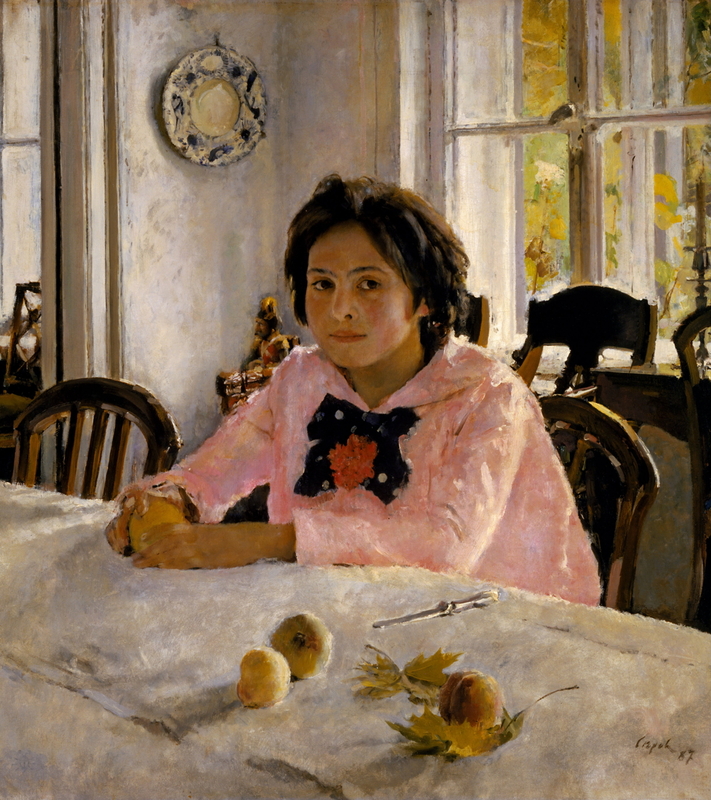 Serov was probably the most overt and sustained impressionist in Russia, and although his later works may have moved on to more modernist styles, they retained the high chroma and loose brushstrokes which he had developed back in the late 1870s. Posted in Painting and tagged Impressionism, Levitan, painting, Penates, Repin, Russia, Serov, Tretyakov, Ukraine. Bookmark the permalink.